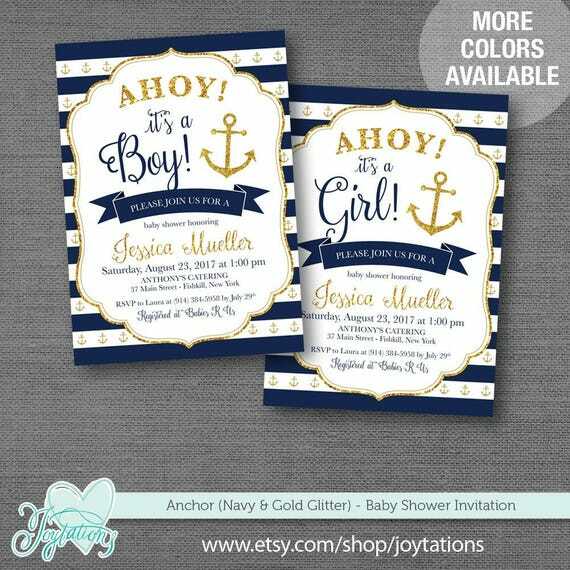 "Anchor (Navy and White Stripes) 1N" baby shower invitation personalized with your own wording and your choice of colors. This invitation prints faux glitter. Your choice of high resolution print ready PDF digital files (won't be shipped to your home) or printed invitations on 110 lb. white matte card stock with white envelopes which will be shipped to your home. This invitation measures 5"x7" (inches). The size of this invitation can NOT be changed. If ordering printed invitations (will be shipped to your home), a digital proof will be sent to you via Etsy message within 1-2 business days (Monday-Friday) from the date of purchase. Joytations is closed on Saturdays, Sundays and Holidays. Once you receive your proof, please look over it carefully to make sure everything is perfect. If you need revisions on the text, please let me know as soon as possible. If you should need revisions, you'll receive your new revised proof in 1-2 business days (Monday-Friday) from the date your revisions were sent to me on Etsy. Two free revisions are included in pricing. Additional revisions are $5.00 per revision. You MUST send me an approval to let me know that your invitation is perfect. Your invitations will NOT be printed until I receive an approval from you. After you approve your proof, please allow 2-3 business days (Mon-Fri) for printing and an additional 3 business days (Mon-Fri) for shipping. Printed items are shipped via FedEx within 6 business days (Mon-Fri) after you approve your proof. Please note that holidays and/or QC issues may add additional processing times. If ordering digital files (won't be shipped to your home), you'll receive 1 PDF file setup to print 2 invitations on 8.5"x11" (inches) paper and 1 PDF file setup to print 1 invitation on 5"x7" (inches) paper. Digital files are for you to print at home or at a print shop. If you purchase digital files, physical item(s) will NOT be shipped to you. If you purchase digital files, Joytations recommends printing on at least 100 lb. white matte card stock and you'll have to purchase A7 envelopes to mail them. After purchase AND I've received all of your information to design your invitation, your high resolution print ready PDF digital files will be sent to the e-mail address that you have on file with Etsy in 2-3 business days (Monday-Friday). Joytations is closed on Saturdays, Sundays and Holidays. If you prefer a different e-mail address, please let me know in the "Notes to Seller" section at checkout. Once you receive your files, please look over them carefully to make sure everything is perfect. If you need revisions on the text, please let me know as soon as possible. If you need revisions on the text, please let me know as soon as possible. If you should need you need revisions, you'll receive your new revised proof in 1-2 business days (Monday-Friday) from the date your revisions were sent to me on Etsy. Two free revisions are included in pricing. Additional revisions are $5.00 per revision. Under "DIGITAL FILE OR PRINTED" select "Digital 2-3 Biz Days". If you need your digital files sooner than 3 business days (Mon-Fri), Joytations offers the option to rush your order to receive your high resolution print ready digital files the next business day (Monday-Friday) for an additional fee. Joytations is closed on Saturdays, Sundays and Holidays. Once you receive your files, please look over them carefully to make sure everything is perfect. If you need revisions on the text, please let me know as soon as possible. If you need revisions, you'll receive your new revised proof the next business day (Monday-Friday) from the date your revisions were sent to me on Etsy. Two free revisions are included in pricing. Additional revisions are $5.00 per revision. Under "DIGITAL FILE OR PRINTED" select "Digital Next Biz Day". - Under "DIGITAL FILE OR PRINTED" select "Digital 2-3 Biz Days" to receive your digital files within 2-3 business days (Mon-Fri), select "Digital Next Biz Day" to receive your digital files the next business day (Mon-Fri) or select the quantity of printed invitations you'd like. - "It's A Boy" or "It's A Girl"
** PLEASE FOLLOW THE SAMPLE PHOTO ABOVE. ADDITIONAL INFORMATION THAN WHAT'S SHOWN IN THE SAMPLE PHOTO WILL NOT FIT ON THIS INVITATION. Printed items are ONLY being shipped to the United States at this time. Standard shipping costs on printed items are FREE! After you approve your proof, please allow 2-3 business days (Mon-Fri) for printing and an additional 3 business days (Mon-Fri) for shipping. Printed items are shipped via FedEx within 6 business days (Mon-Fri) after you approve your proof. Please note that holidays and/or QC issues may add additional processing times. If you need your order rushed, you MUST message me BEFORE purchasing with the date you need your order by and the quantity of each item along with your address so I can provide you with a next day rush quote. Your order will be shipped to the address that you have on file with Etsy unless you let us know otherwise. Please make sure that your address is up to date! Printed colors may vary from our images depending on your printer's quality and settings. All edits are made by Joytations. Customers can NOT edit any of Joytations' digital files. Items must be purchased in order to receive digital files. Joytations does NOT offer free proofs/samples. Joytations does NOT, under any circumstances, offer refunds, exchanges or cancellations on digital files (instant download items nor custom items). If your printed items are damaged during shipping, please message me right away. I will either reprint and ship your order to you in 1-2 business days or a full refund will be issued. When you purchase digital files from Joytations, you are licensed to use the digital product for personal or non-profit use ONLY. You may NOT copy, reproduce, share, or transfer any of the files to a third-party. ©2015 Joytations. All rights reserved. For unique usage and personal use ONLY. You may NOT re-sell, share or copy my designs.